University of Nebraska-Lincoln engineers have doubled the efficiency of a prominent solar cell technology by unraveling the origins of a phenomenon known to hinder cell performance, stability and evaluation. The researchers investigated a persistent problem with solar cells made of perovskite, which refers both to a type of atomic structure and any material that features it. As a naturally abundant and inexpensive material, perovskite has gained significant interest among solar cell manufacturers and researchers in recent years. However, a certain class of perovskite-based cell exhibits photocurrent hysteresis – undesirable shifts in electrical conductivity that arise when applying increasing or decreasing amounts of voltage to a cell for the purpose of measuring its photocurrent. Led by Jinsong Huang, associate professor of mechanical and materials engineering, the research group determined that this hysteresis results from the presence of "traps" that can ensnare electrons and consequently reduce electric current. 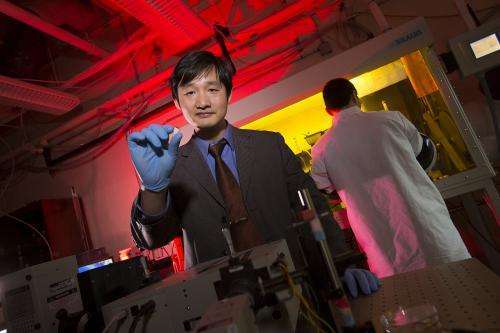 These traps also diminish the lifespan of perovskite-based devices and complicate measurements of how efficiently such devices convert sunlight into electricity, Huang said. "It makes measurements of efficiency much more difficult and much less accurate. It can actually lead to false information about how efficient a device is," Huang said. "That matters a lot in the field of photovoltaics, because even a one-percent increase is a big deal." Huang's team further identified the sites of the traps, which reside both at perovskite's surface and along the boundaries of microscopic grains that form its foundation. Equipped with this information, the researchers turned their attention to resolving the hysteresis problem – and discovered that the answer was more straightforward than expected. "There's been a strong debate in the solar cell community about how to get rid of hysteresis," Huang said. "What makes this very exciting is that we did it just by using molecules – fullerenes – that are already used frequently in organic solar cells." When the researchers fabricated and deposited a thin film of fullerenes onto the perovskite, they found that it effectively filled a large number of the traps and subsequently made the solar cell two times more efficient. "We expected to see an increase, but we didn't expect the efficiency to double," Huang said. "And it's a simple method that's really easy for us and anyone else who would want to replicate it." The team's findings were published in the Dec. 15 edition of Nature Communications, the Nature Publishing Group's multidisciplinary online journal of research in all areas of the biological, physical and chemical sciences. Going from 1% to 2% is still useless when solar panels are cheap and going from 15% to 16%. Solar panels of this genre, per wiki, now can reach 20% efficiency, and companies plan to have them for sale by 2017. I don't think I would call the technology "prominent" like the author did, since they aren't for sale yet, but I would say "promising" and congratulate the researchers on their contribution. Two more efficient - it went form 20% efficient to 60% efficient. Twice as efficient - it went from 20% efficient to 40% efficient. Consult the AP style guide - or sixth grade arithmetic.